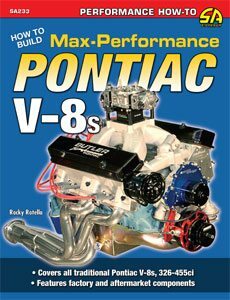 The Pontiac V-8 valvetrain is a simple overhead-valve design that’s comprised of several different components. Each cylinder uses one intake and one exhaust valve that allows the engine to ingest and expel the combustible air/fuel mixture and spent exhaust gasses. A single camshaft located in the center of the block actuates the valves by transferring lobe lift through a .842-inch-diameter tappet (or lifter), a long pushrod, and a rocker arm that pivots on a ball socket and stud arrangement. The entire system is a very efficient and effective design. The camshaft opens and closes the valves at specific points in crankshaft rotation. Nearly all production engines were fitted with hydraulic valve lifters. Notice the “00” cast into the lifter galley. It denotes 400-ci displacement. Pontiac planned for its V-8 to use hydraulic lifters. During development the block’s lifter bores were designed to deliver an adequate volume of pressurized oil for proper hydraulic lifter operation. The oil allows the lifter to continually adjust valve lash so that the entire valvetrain remains in constant contact, which provides a low-maintenance design that operates quietly and consistently throughout the life of the engine. With the exception of certain limited production Super Duty and Ram Air engines that used mechanical camshafts for maximum performance, all other Pontiac V-8s were fitted with hydraulic lifters. A typical hydraulic lifter is quite complex. It consists of an outer body and internal plunger. Plunger depth within the body is controlled by a combination of oil and spring pressure. When the lifter is on the base lobe of the camshaft, pressurized oil enters the lifter body though a feed hole and floods a cavity located just beneath the plunger. As the cam rotates and the lobe lifts the lifter body, a spring loaded check-ball within the plunger reacts to valvespring pressure, isolating the lifter from the engine oil supply. The lifter and plunger then raise as a unit, ultimately lifting the valve off its seat. A hydraulic valve lifter is rather complex. It uses a combination of mechanical spring pressure and oil pressure to continually adjust the pushrod cup, taking up valve lash for quiet and consistent valvetrain operation. Some lifters have higher rates of adjustability than others. Expect reliable performance from the lifters sold by large camshaft manufacturers. Pontiac literature generally lists only the advertised duration for its camshafts. That can be recorded at whatever lift point Pontiac chose. 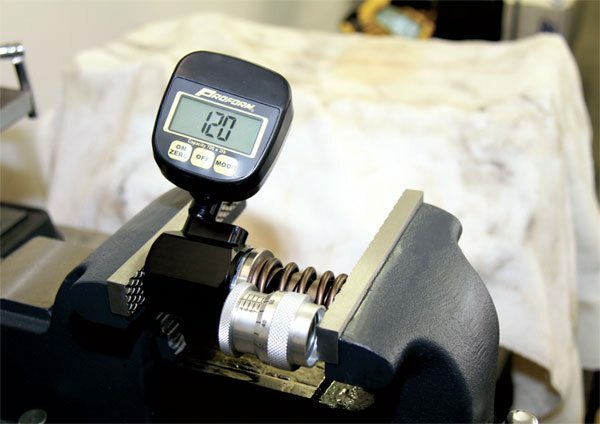 Measuring duration at .050-inch lobe lift simplifies camshaft comparisons and gives a more accurate indication of the effects a particular camshaft has on total engine operation. The lifter fixture with dial indicator from Comp Cams is part of the camshaft degree kit I routinely use. As the camshaft rotates, the oil trapped beneath the plunger is pressurized and bleeds outward as the plunger further reacts against valvespring pressure. 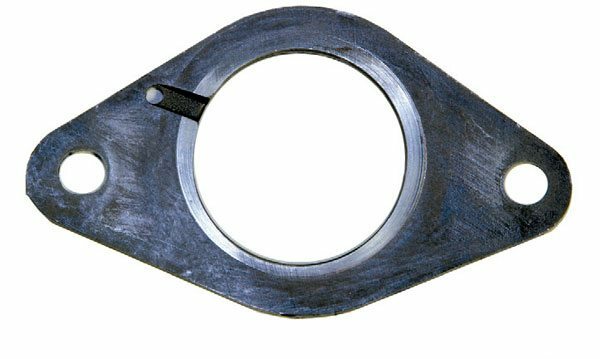 This bleeding is referred to as “leakage,” and the rate at which a lifter leaks is controlled by using various degrees of lifter-body-toplunger clearance during manufacturing. The leak rate of Pontiac’s hydraulic lifters varied with the original application, and some, such as those for the Ram Air IV were specially designed to mimic the effects of a mechanical camshaft to maximize performance while maintaining a low-maintenance valvetrain. A camshaft opens and closes the valves at specific points during crankshaft rotation. Those values, along with a few others makeup the “timing” or “events” of a particular cam. 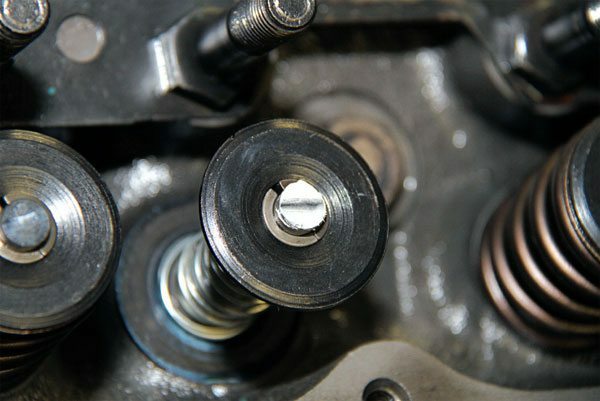 The amount of time an intake or exhaust valve is off its seat is referred to as “duration” and it’s expressed in degrees of crankshaft rotation. Since the crankshaft must rotate twice (or 720 degrees) to complete a single four-stroke cycle, the timing set gears are appropriately sized so that the camshaft operates at half the speed of the crankshaft. Camshaft duration can be measured at most any point of lifter rise and fall. “Advertised” duration is typically the amount of crankshaft rotation recorded between .006 inch of lobe rise and .006 inch of lobe fall. Advertised duration can have different meaning for different manufacturers, however. 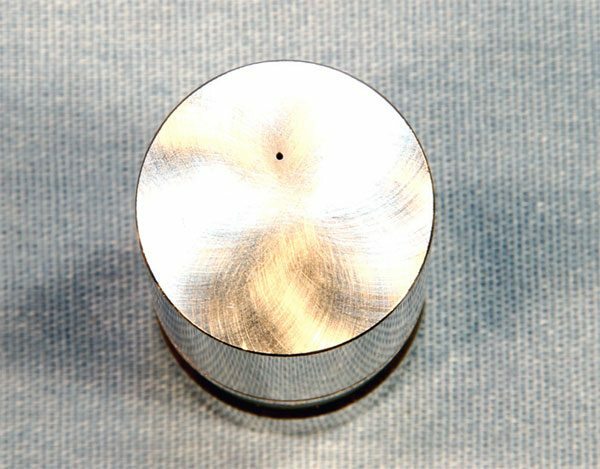 Aftermarket manufacturers began providing duration specifications at .050- inch lobe lift so consumers could compare various cams and predict the performance effects. That particular value was selected because it’s a reference point that easily measured and it’s about the point that significant airflow begins. Duration determines the operating range of a particular engine. A short duration cam accentuates low RPM power. As engine speed increases, it has a limited amount of time to fill or exhaust its cylinders before the piston changes direction. Increasing duration allows better cylinder fill and evacuation at high RPM, which promotes maximum power production in the operating range the engine is heaviest loaded. Generally speaking, larger engines can tolerate more duration without negatively impacting low speed performance. The amount of camshaft duration a combination performs best with must match the size and intended operating range of the application. Other factors such as the position of the Intake Centerline (ICL) and Lobe Separation Angle (LSA) can be used to slightly improve idle quality or low speed street manners, or broaden the entire power band. Pontiac’s Engineering learned early on that cutting-edge camshaft design could put its production V-8s on the forefront of the performance market. It spent a great deal of time developing and testing various valve timing combinations to determine exactly what its engines performed best with. During the late 1950s and early 1960s, Pontiac’s production camshafts were so well designed that oftentimes the factory-installed unit was capable of performance on par, or even slightly better than, many of the aftermarket units of the day. Pontiac’s original rocker stud doesn’t allow for manual valve lash adjustments. Its 7/16-inch shoulder tapers into 3/8- inch upper threads, and breakage can occur at the bottleneck with a high-lift and/or aggressive profile cam. To provide the durability required for its Ram Air IV, which featured valve lift greater than .500 inch, Pontiac used a 7/16-inch rocker stud, which necessitated manual lash adjustment using a crimp-style rocker nut. Pontiac used flat-tappet camshafts in its production V-8s. Constructed of a castiron core with hardened lobes, the factory cams were expertly chosen to maximize the performance of a particular application early on. When emissions concerns were of greater importance during the 1970s, performance was sometimes sacrificed to reduce emitted pollutants. The factory performance cams still provide excellent performance in modern builds. With an adjustable valvetrain and hydraulic lifters, lash adjustments are accomplished by tightening the adjuster nut and spinning the pushrod with two fingers. Zero lash is the point where you just begin feeling pushrod drag. Depending upon the lifter manufacturer, recommended preload is generally between a half and one full turn past 0. Malcolm R. McKellar was one of the Division’s top camshaft designers. In an interview before the retired Pontiac engineer’s passing, he noted that the factory cams generally contained between 210 and 230 degrees of .050-inch intake duration, and several extra degrees of exhaust duration to compensate for the lesser exhaust port flow (when compared to the intake port) and the complete exhaust system. The lobe centers (or LSA) were generally spread several degrees apart to improve idle quality and allow an engine to be livable on questionable quality fuel. 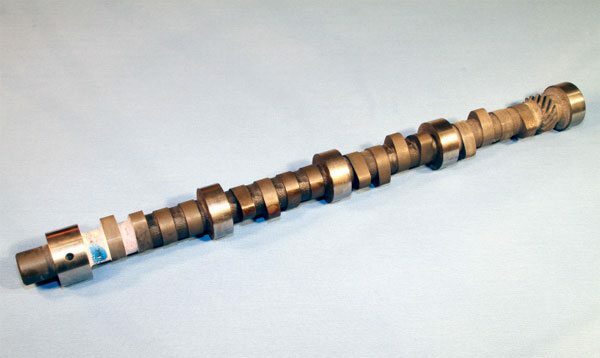 It’s not uncommon to find a Pontiac camshaft with an ICL and LSA of 113 degrees or more. Gross valve lift was limited to just over .400-inches for most applications. McKellar reasoned that Pontiac chose that particular amount because its cylinder heads generally contained rather large valves, and when combined with the small, high-velocity ports, high valve lift simply wasn’t required to attain strong performance. The moderate valve lift allowed Pontiac to provide its customers with a good running vehicle that featured a low-maintenance valvetrain that was relatively free of durability issues over the life of the engine. 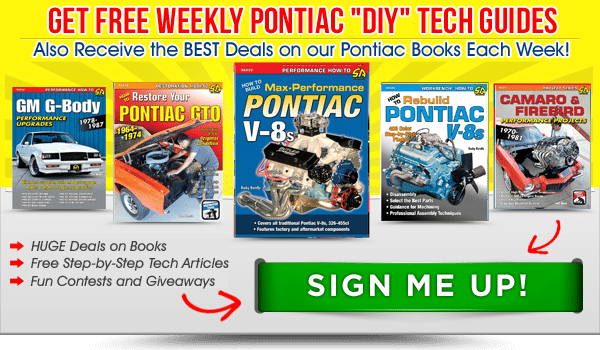 Pontiac used a number of hydraulic camshafts in its V-8 engines over the years. 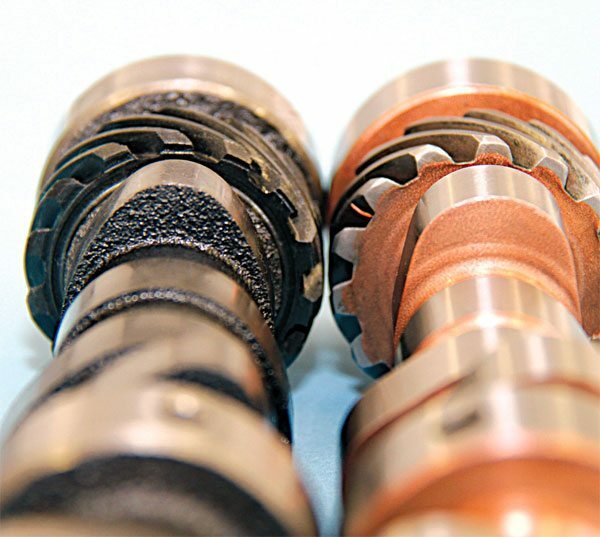 Even though it may seem as if two factory cams are virtually identical, each grind features some type of unique lobe placement to complement its original application. The high-performance Pontiac cams hobbyists are most familiar with are the 068 and 041 grinds developed during the 1960s. The 068 was developed for high performance street use and contains 212/225 degrees of .050-inch duration and just over .400-inch valve lift. The 041 is a high-lift cam is most closely associated with the R/A IV, Pontiac top performance mill introduced in 1969. It contains 231/240 degrees of .050-inch duration and .470 inch of valve lift. Both are still available from OE-spec parts suppliers such as Melling and remain popular with performance enthusiasts looking for stock-type camshafts. Rocker arms transfer camshaft lobe lift into valve lift. 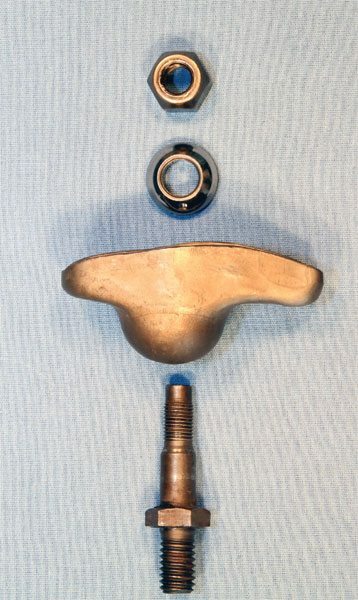 The original Pontiac V-8 rocker arm, a stamped-steel unit pivoting on a fixed rocker stud, was developed and patented by Pontiac Engineer Clayton B. Leach. It was a very simple design that was so effective and cost efficient that many other automakers soon developed similar variants. Pontiac’s rocker contained a 1.5:1 ratio, which allowed slightly more than .400-inch valve lift when combined with a lobe lift that’s slightly greater than .270 inch. I have carefully measured several well-used originals and even an NOS unit and found the actual ratio closer to 1.48:1 on average. A 1.65:1 ratio rocker arm was developed for certain high-performance applications. Available through Pontiac’s parts departments, it was a popular upgrade for many years after. Some aftermarket companies made low-quality knockoffs that offered a lesser ratio despite a claim of 1.65:1, but those I’ve measured from Pontiac were exactly 1.65:1. Developed by Pontiac Engineer Clayton Leach, the V-8 used a simple ball-stud rocker arm that was very efficient and cost effective. A rocker arm ratio of 1.5:1 was used on most production engines. Early Super Duty and Ram Air IV engines used an identical rocker arm but with a 1.65:1 ratio to increase valve lift. 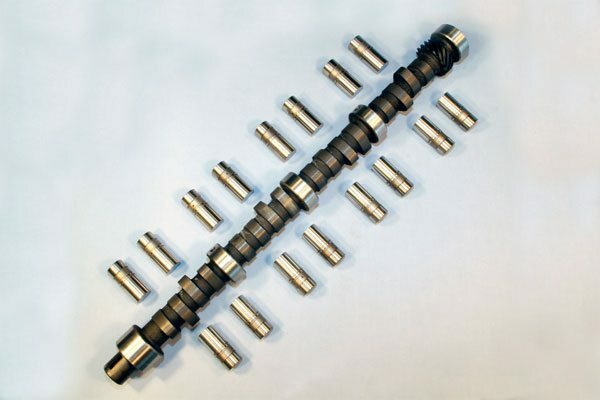 Flat-tappet camshafts remain very popular. 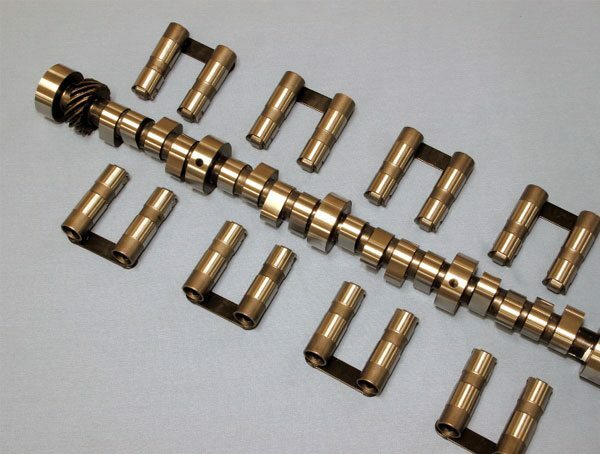 They are produced and sold by a number of aftermarket camshaft manufacturing companies. Often overshadowed by modern roller cams, flat-tappets continue to offer an excellent dollar-per-horsepower value. They are capable of providing serious performance at a reasonable cost. Despite those relatively minor shortcomings, aftermarket hydraulic flat tappet camshafts remain quite popular with Pontiac hobbyists. Modern cam and lifter production techniques have essentially eliminated those concerns. A flat-tappet hydraulic cam is an excellent choice for any Pontiac engine regardless of the intended application, particularly if on a budget. 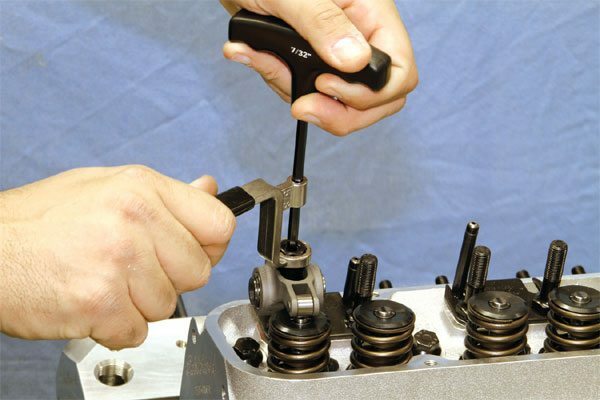 When combined with a high-quality lifter set such as that from Comp Cams, a modern flat-tappet is capable of producing a significant amount of high-RPM horsepower at a very reasonable cost. Generally speaking, a new cam and lifter set costs less than $250, and some companies such as Summit Racing even offer low-buck sets for those on a very limited budget. The low cost allows hobbyists to try several different units to determine which performs best with a particular engine. Generally speaking, a typically modified 467-ci Pontiac street engine might perform best with 230 to 235 degrees of .050-inch intake duration, but it’s not unusual to find peak performance of a similarly- sized modern high-RPM race engine with 250 degrees of .050-inch duration or more, but you cannot expect the engine to operate well as speeds at less than about 3,000 rpm. Pontiac used manual-lash flat-tappet camshafts in its max-performance applications such as its SD-421. More commonly described as a “mechanical” or “solid” cam, it uses a lifter with a fixed pushrod cup that offers no hydraulic cushion. The intent is to allow the lifter to transfer the exact lobe profile to the valve, which can add several horsepower at high RPM while allowing the engine to operate more consistently at high speed. The valves must be manually lashed and occasionally maintained. 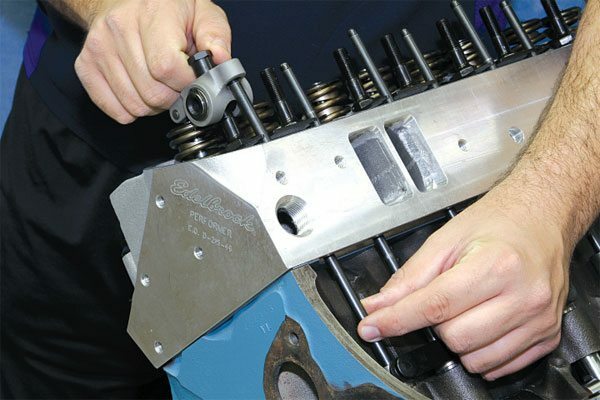 A feeler gauge between the rocker arm and valve tip is used to provide a specific amount of clearance gap that changes as the engine approaches normal operating temperature and the block and cylinder heads expand. An audible “tick” occurs as the gap is taken up during each revolution, which gives solid cams their distinctive sound, but it also consumes a certain amount of duration in the process. In fact, while it might first appear that an engine can tolerate more duration with a solid-lifter cam, the solid cam must oftentimes be 10 to 20 degrees larger at .050 inch to provide the engine with the same amount duration as a comparable hydraulic. A hot lash setting around .025 inch is fairly typical, but the exact recommendation will vary with manufacturer and operating conditions. The various expansion rates of the materials used to construct blocks and cylinder heads will dictate how much lash should be added or subtracted to that recommendation to compensate for thermal growth when setting lash on a cold engine. Aluminum expands at a different rate than cast iron, so be sure to confer with the manufacturer to determine just how much cold lash is required for your particular combination. Regular valve-lash maintenance was once required, and the perception continues to limit the popularity of solid camshafts for street applications. 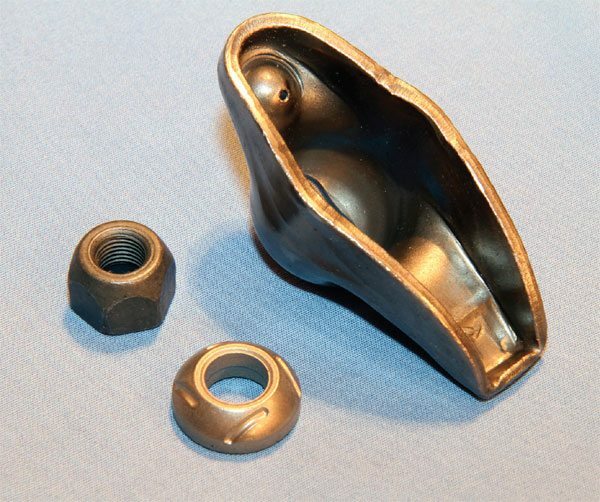 Modern rocker arm studs containing a flat flange and positive locking nuts have essentially eliminated the need for continual valvelash adjustments. A solid-lifter cam offers no hydraulic cushion to minimize valve lash. The lifter has a fixed pushrod cup and simply passes oil to the pushrod for rocker arm lubrication. 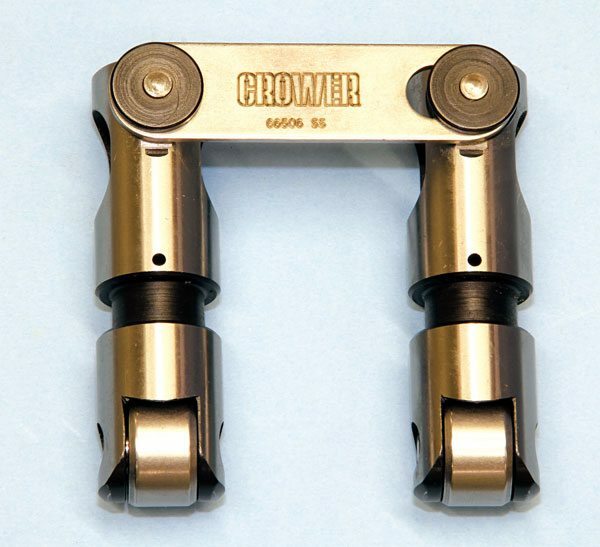 Crower’s solid lifters are internally restricted, eliminating the need for block modifications. The Cool Face option includes a machined hole on the lifter face that directs pressurized oil between the lifter and lobe, positively lubricating the pair to reduce wear. With a solid-lifter cam, valve lash must be set using a feeler gauge positioned between the rocker arm and valvestem tip. A certain amount of valve lash is required to allow for thermal expansion. The recommended amount varies with the components being used and the manufacturer. I recommend verifying valve lash seasonally. Minor adjustment is normal. Larger adjustments may indicate an underlying issue. An adjustable valvetrain is required whenever the block and/ or cylinder heads are machined moderately. Proform offers a special wrench (number-66781) that allows for quick and easy valvetrain adjustments when using positive locking rocker nuts. 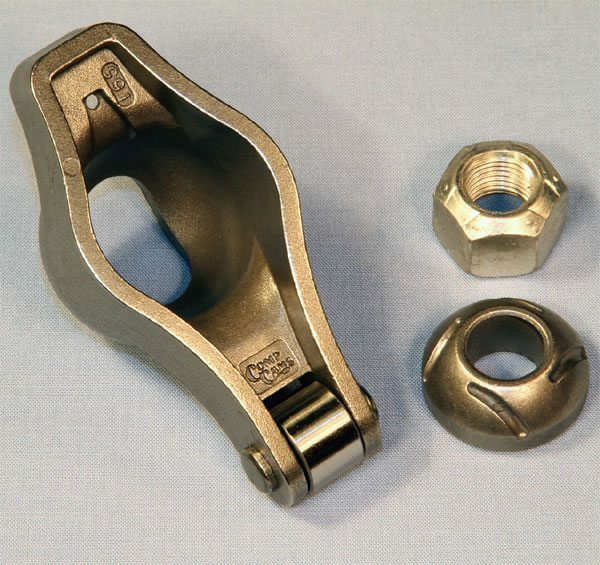 A long-handle 5/8-inch wrench tightens the rocker arm adjuster nut while a 7/32-inch hex-head wrench tightens the internal set screw independently. Once the proper lash adjustment is reached, simply tightening both simultaneously positively locks the rocker nut. While many camshaft manufacturers can provide you with a quality off the- shelf or custom solid-lifter grind for Pontiac V-8, finding suitable Pontiac specific solid lifters can be much more challenging. Hydraulic lifters require a large volume of pressurized oil for proper operation, and it also supplies the pushrods with oil to lubricate the rocker arms and valvesprings. A solid lifter, on the other hand, simply passes oil from the lifter bore to the pushrod. Without limiting the supply of pressurized oil that reaches the pushrod, the oil pump can place more oil in the valve cover area than the engine can effectively return to the oil pan sump. That can cause oil to pool around the valveguides and enter the engine, or run the pan dry, effecting performance and/or reliability. Pontiac used solid lifters that were internally regulated, but most aftermarket solid lifters in the past were modified hydraulic units that offered no internal regulation. Tapping the block to accept lifter bore restrictors was once commonplace, but Crower now offers Pontiac-specific lifters that are internally regulated to limit oil to the top end as well as offering its Cool Face option that positively lubricates the lifter and lobe. In my opinion, they are the only way to go if you’re considering a solid-lifter cam. Roller camshafts for Pontiacs have been around since the 1960s, but have become widely popular in recent years. That term can be somewhat misleading, however. The camshaft closely resembles a flat-tappet unit. It’s the lifter body that’s modified to accept a hardened roller wheel lending to the name. The lifter’s roller wheel reduces the friction associated with a flat-face lifter sliding across the lobe surface. In theory, that in itself can free up a few horsepower, but that’s not always the case. The main advantage directly related to friction reduction is the ability to run a more aggressive lobe profile when compared to a similar flat-tappet. Opening the valve at a quicker rate translates into greater .050- and .200- inch duration without requiring additional advertised duration, and that can improve idle quality and low-speed street manners while maximizing peak performance. Hydraulic roller cams have been around for several years. Combining those advantages mentioned above with hydraulic action produces a valvetrain that operates quietly and reliably for thousands of miles. Auto manufacturers began using hydraulic roller cams in production engines during in the 1980s and virtually all modern-production passenger vehicles use a roller cam. Aftermarket camshaft companies began producing retrofit hydraulic roller cam kits for the Pontiac V-8 during the 1990s. The relatively heavy weight of the hydraulic roller lifter and the valvespring pressure required to control it at high RPM caused the lifter to leak uncontrollably, which led to erratic operation. It took cam companies a few years to find a permanent solution. 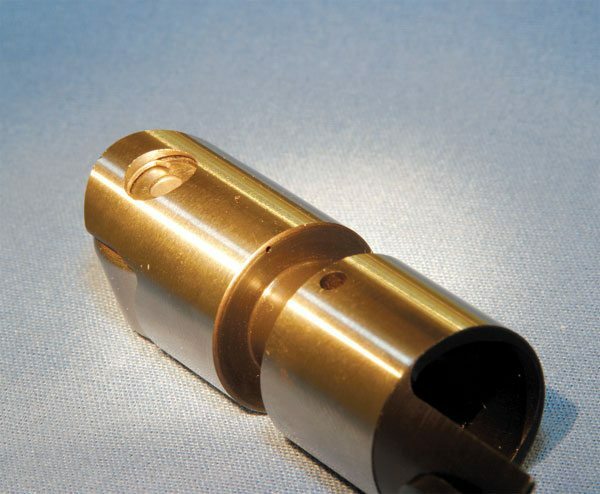 Many hobbyists developed a negative perception toward the reliability of hydraulic roller cams in that time, particular in high-performance applications. That’s no longer the case, however. Modern hydraulic roller lifters such as those available from Comp Cams, Crane Cams, or Lunati are much improved. You can expect such lifters to operate consistently and reliably up to 6,000 rpm, and possibly even more. Beyond the initial cost, which can be as much as $800 or more for the cam and lifters, there really are no negatives to using a hydraulic roller cam in any street engine or a competition engine that operates at or near a maximum speed of 6,000 rpm. Roller lifters use a larger roller wheel to reduce the sliding friction associated with a flat-tappet cam. The friction reduction allows quicker opening and closing rates for the camshaft lobe, which improves engine operation and performance. Hydraulic roller lifters continually adjust to minimize valvetrain lash and provide quiet operation. Reliability was once questionable, but modern high-quality lifters are much improved. Hydraulic roller cams are very popular in modern performance builds. They increase performance while providing a quiet valvetrain that requires little maintenance. A cam and lifter set like this from Comp Cams costs several hundred dollars, but you get what you pay for. Comp’s hydraulic roller lifers are among the best available today. It’s easy to see how roller cams improve performance. These two contain similar .050-inch duration and valve lift specifications, but the roller lobe (right) reaches peak valve lift much quicker and maintains it longer than the high-performance flat-tappet (left). A roller cam holds the valve open longer at higher lifts, allowing the engine to ingest more air to improve performance, but it also increases the amount of time the valve remains fully seated, which improves idle and drivability. 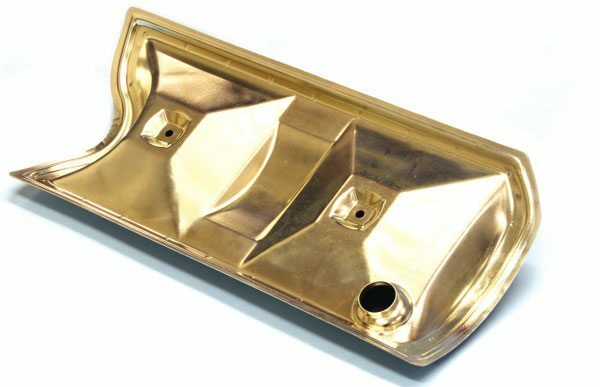 The valley pan is an integral part of a Pontiac’s PCV system and oil vapors are continually passing through it. It’s not uncommon to find heavy sludge deposits caked inside an original. Abrasives should never be used because small particles can hide in crevices and fall into the engine causing significant damage. The new Tomahawk valley pan from Pacific Performance Racing is an OE replacement that fits and functions like a stocker, but is modified internally to accommodate roller lifters. Raw sheet-metal valley pans are also available, but may not be compatible with the stock PCV system. A solid-roller lifter acts like a flat-tappet lifter in that it has no hydraulic action to minimize valvetrain lash. The aggressive lobe profile associated with a solid roller cam maximizes performance. The solidroller lifters for the Pontiac V-8 produced by Crower Cams are very popular with professional engine builders. The quick lobe action of a solid-roller camshaft and the valvespring pressure required to control it are very hard on the roller wheel and its bearings. Comp Cams and Crower each offer solid-roller lifters for the Pontiac V-8 that includes a jet of oil that positively lubricates the bearing area. It significantly improves longevity in extreme applications. The camshaft retainer in a Pontiac V-8 also acts as a thrust plate, taking up forward thrust. After thousands of miles with a flat tappet, a slight amount of polishing where the camshaft rides is normal, and there should be no issue reusing an original in a performance rebuild. Wear like this should be considered excessive, however, and an original in excellent condition or a suitable reproduction should be used. The hardened steel core of a roller cam can accelerate retainer plate wear. Roller timing sets are commonly used during Pontiac V-8 rebuilds. High-quality units like this from Sealed Power (number-CTS-3112R) include durable sprockets and a high-quality roller chain with dual rows that resist excessive stretching. 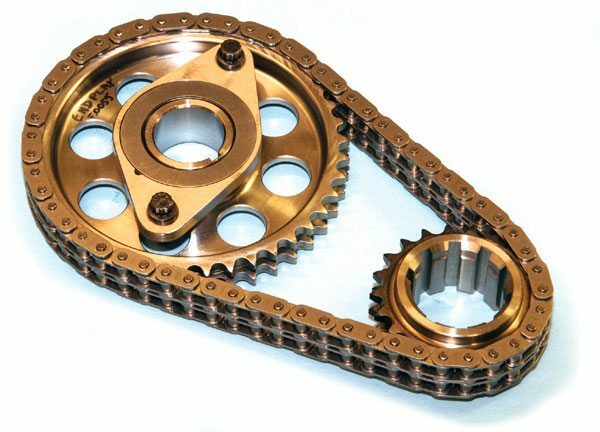 The crank sprocket generally includes more than one keyway, which can be used to slightly advance or retard the camshaft to improve performance. The set sells for about $150 and is quite suitable for mild to moderate performance builds. A few companies produce a roller timing set for the Pontiac V-8 that uses billet-steel gears to improve accuracy and durability. The crank sprocket usually contains a number of keyways for complete cam adjustably. Sims Performance Machining uses a Rollmaster timing set to produce its unique roller retainer set that’s designed to reduce friction and improve reliability in extreme applications. The distributor drive gear of a hardened steel roller cam isn’t compatible with the iron driven gear typically found on original and aftermarket distributors. Failure results in sending metallic filings throughout your engine. 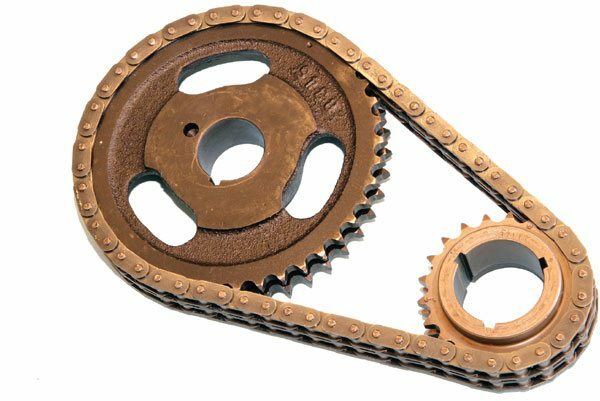 Though a few cam companies offer a pressed-on iron drive gear as an extra cost option, it isn’t very common. 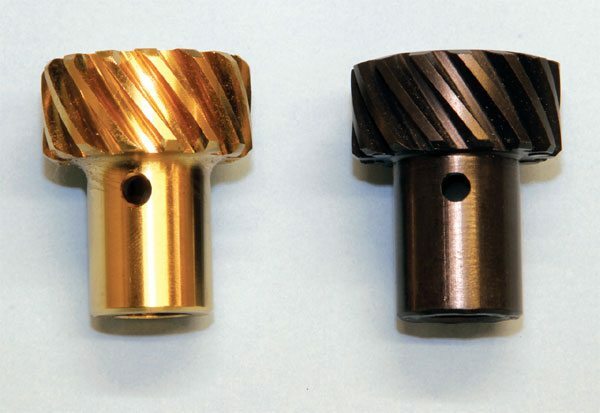 If you’re using a roller cam in your Pontiac, a high quality brass unit like that from MSD (left) or polymer driven gear like that from BOP Engineering (right) is your best option. Sims Performance Machining developed a new camshaft retainer that’s fitted with Torrington bearings. It’s designed to reduce friction, improve durability, and limit camshaft thrust to maintain steady spark timing. It’s an excellent concept that’s available only from Sims. It sells for less than $275 and is compatible with any application, but particularly ideal for those that regularly operate under heavy load at high RPM. Using my own 467-ci Pontiac as a test subject, I compared a few different high-performance hydraulic camshafts on the dyno to determine what performance benefits a roller might offer over a flat-tappet. Using camshafts with similar .050-inch duration specs and lobe placement, I found the roller improved idle quality and manifold vacuum, while noticeably improving midrange torque and slightly improving peak horsepower. I found that my engine operated better at all speeds and conditions. I believe that the gains I saw were directly related to the aggressiveness of the roller lobe profile. When compared to the flat-tappet, the roller cam offered greater seat time (or less advertised duration) and contained nearly 20 degrees more .200-inch duration, which indicates a much quicker opening and close rate. The extra “area under the curve” made the camshaft a p p e a r larger at high RPM, while the lesser advertised duration reduced valve overlap, which improved idle quality and vacuum. Solid-roller cams provide the greatest potential for peak performance, but until recent years, reliability was a serious concern. The high-rate valvesprings required to effectively control valve action when using a camshaft with very aggressive lobe profile, it was not only hard on valve seats, it had the tendency to pound on the small roller bearings that separated the roller wheel and axle, which eventually leads to failure, which can then cause significant collateral damage. Not enough valvespring pressure for the application can cause the lifter to bounce, resulting in a similar consequence. A few companies producing solidroller lifters for the Pontiac V-8 have found a solution that greatly improves reliability. Comp Cams, Crane Cams, and Crower Cams each offer Pontiac-specific lifters that direct a constant supply of pressurized oil to the roller wheel and axle assembly to positively lubricate the needle bearings. The lubrication cools and cushions bearings, significantly lengthening service life. Isky also produces solid-roller Pontiac V-8 lifters, and one is available with a low-friction roller that’s free of needle bearings to maximize strength in the most severe applications. Like Crower’s flat-tappet solid lifters, most quality solid-roller lifters are internally regulated and do not require separate lifter bore restrictors to prevent excessive oil delivery to the top end. Since there are so many solid-lifter options, I suggest contacting the manufacturer to determine whether those you are considering are self-regulating and include high-pressure bearing oiling. Expect to spend $500 or more on a quality set of solid-roller lifters, and I am comfortable recommending any of those above. Some hobbyists successfully run a mild-spec solid-roller camshaft on the street without issue. In those instances I recommend occasionally checking valve lash to ensure it hasn’t deviated from the original setting, which may signal abnormal wear. If lash is within spec, it’s unlikely that you’ll encounter any significant issue as long as the valvespring pressure doesn’t degrade. For a competition engine, I highly suggest inspecting the lifters seasonally. Most lifter manufacturers offer a rebuilding service where the lifters are thoroughly inspected and repaired accordingly at a very reasonable cost and in a timely manner. An engine sees camshaft duration and lift at the valve through the rocker arm that pivots on a stud. Gross valve lift is calculated by simply multiplying camshaft lobe lift by the rocker-arm ratio. The closer the pushrod cup is to the pivot point (or fulcrum) the greater the resultant ratio. For production engines, Pontiac found it easier to achieve peak valve lift using moderate ratio rocker arms as opposed to greater lobe lift. Most production engines were fitted units stamped-steel units containing a 1.5:1 ratio. When attempting to achieve a specific amount of gross valve lift, a high-ratio rocker arm is less stressful on the block when compared to lobe lift since the lifter travels less in its bore. 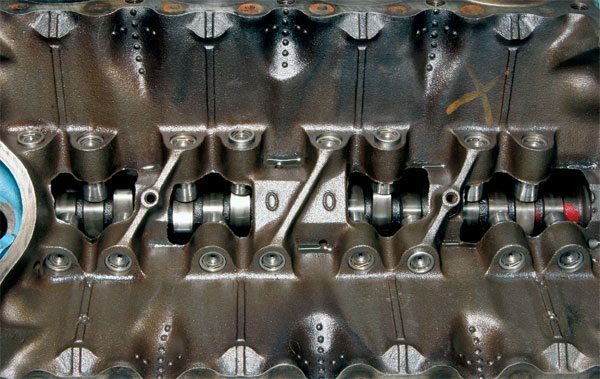 Though it cannot alter the actual opening and closing points of a camshaft, a high-ratio rocker arm not only increases peak valve lift, it opens and closes the valves at a quicker rate, and that can make the camshaft appear a few degrees larger at the same time. A high ratio rocker arm can improve performance in instances where an engine can tolerate slightly more duration or additional cylinder head airflow where available. Original stamped-steel rocker arms, whether 1.5:1 or 1.65:1 ratio, are quite suitable for a stock rebuild, even in engines with mild performance enhancements. Comp Cams expanded on that rocker arm concept, adding a roller wheel in the tip of the stamped-steel body. With installation identical to an original, the roller tip reduces the sliding friction and side loading that can wear the valvestem and/or guide. PRW offers a unit similar to Comp’s. Available in 1.52 and 1.65 ratios for Pontiac, such rockers sell for about $150 per set and are a good choice when replacing a set of stockers. 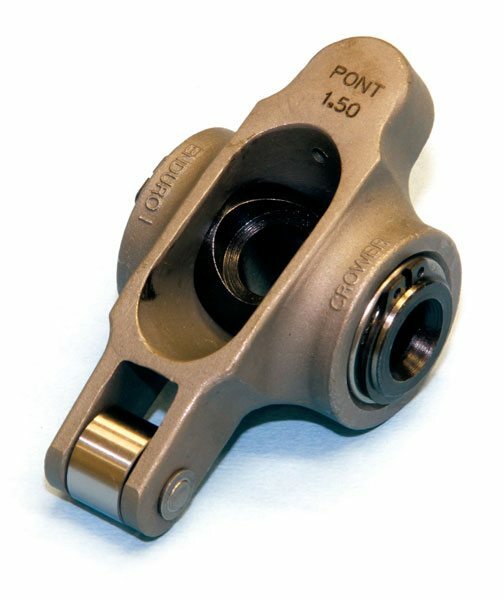 Certain OE manufacturers such as Federal-Mogul and Melling offer new stamped-steel rocker arms in a 1.5:1 ratio for the Pontiac V-8. The quality is generally good and they’re practically identical to the originals. 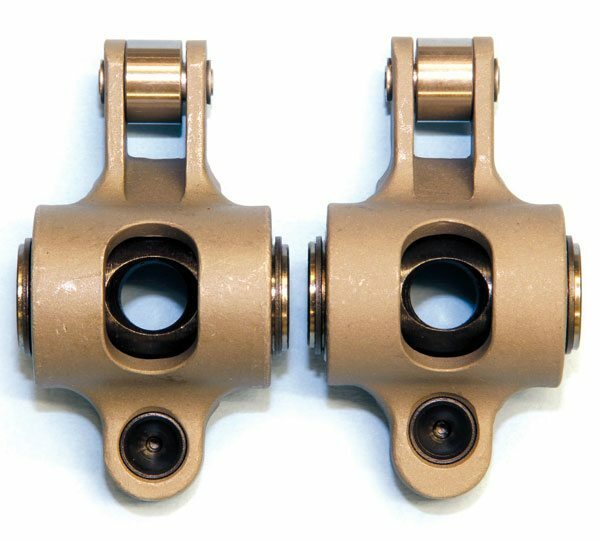 Melling offers this stock-replacement rocker arm with a ratio of 1.65:1 (PN MRK-532). I have used it in stock-type applications without issue, but recommend roller rockers where applicable. To improve the performance of the stamped-steel rocker, Comp Cams added a roller wheel to its tip to reduce friction and valvestem wear. Available in ratios of 1.52:1 and 1.65:1, the quality of Comp’s roller-tip rockers is very good. I recommend them in any application where stamped-steel originals are being considered. The pushrod cup’s position in relation to the fulcrum determines the opening ratio of a particular rocker arm. The closer the pushrod is to the pivot point, the greater the ratio. It’s much easier to understand exactly how it differs by setting two rocker arms with different ratios next to one another. A 1.5:1 ratio rocker is on the left while a 1.65:1 ratio rocker is on the right. 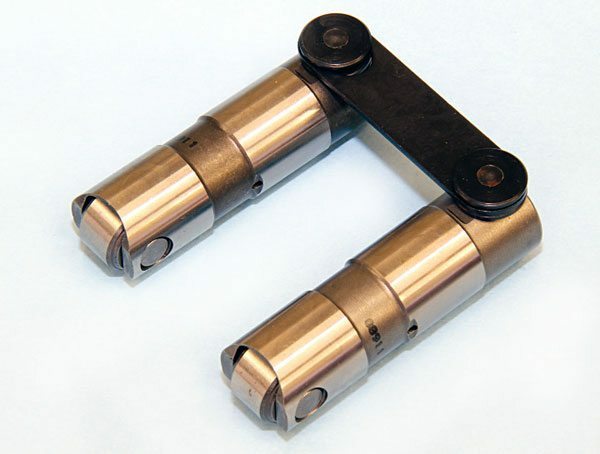 Full roller rocker arms combine a roller tip with a roller fulcrum to further reduce friction. 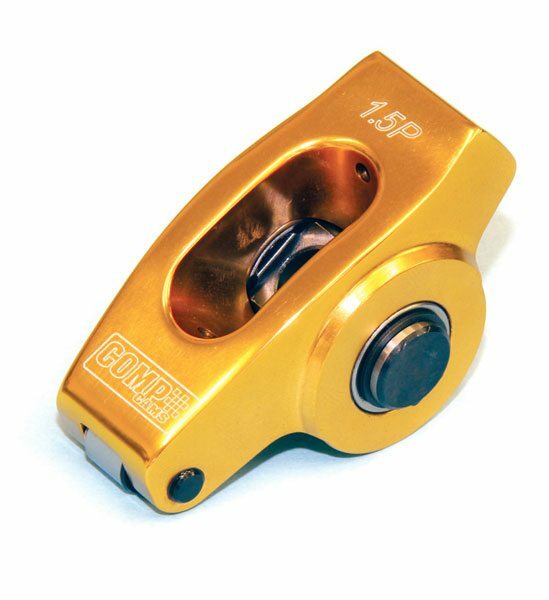 Rocker arms constructed of billet or cast alloy are quite popular in mild to moderate performance builds. Low-buck roller rockers are generally of lesser quality and can fatigue and fail, but high quality units like this from Comp Cams are affordable and reliable. 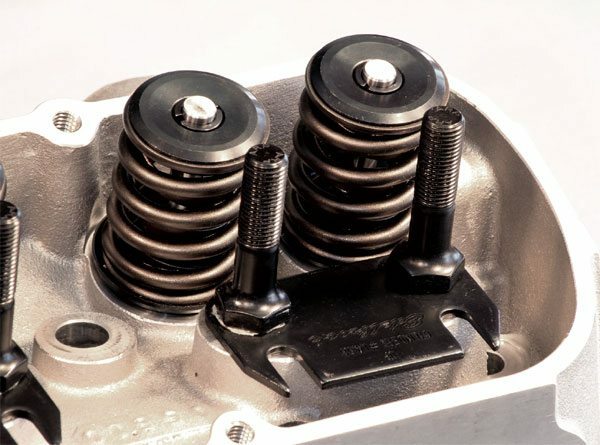 The high-pressure valvesprings required when using an aggressive roller camshaft can cause alloy rockers to deflect under load, leading to fatigue and failure. In those instances, a cast stainless-steel roller rocker arm like this one from Crower is an excellent choice that provides the durability required for high-performance use. Shaft-mounted rocker arms are required for the most extreme applications. In contrast to individual studs, the rocker arms are grouped in pairs, and each pair shares a shaft. Each shaft is then fastened to a single rail, and the rail is fastened to the cylinder head. It eliminates deflection and provides maximum valvetrain stability. Most camshaft manufacturing companies offer full-roller rocker arms for the Pontiac V-8 in a wide array of ratios. Full-roller rockers generally consist of a cast-alloy or stainless-steel body that uses a roller trunion along with a roller tip to minimize friction. I have used cast-alloy rockers from Comp Cams and Crower Cams in various ratios with excellent results in high-performance street combinations, and would expect those from other reputable manufacturers such as Crane Cams and Harland Sharp to perform similarly. Expect to pay around $300 for a quality set. When using high-pressure valvesprings, such as those required with an aggressive solid-roller camshaft, the castalloy roller rockers can fatigue over time. In such applications I feel it’s worthwhile to use a rocker arm constructed of stainless-steel to maximize reliability and durability, and minimize deflection. Crower Cams produces a premium stainless- steel rocker for the Pontiac V-8 that’s available in a variety of ratios and sells for about $500 per set. PRW offers a similar unit for those on a budget, and while quite suitable for myriad applications, I consider Crower’s the best available. A shaft-mounted rocker arm system is the best choice to maintain valvetrain geometry in extreme applications where valve lift approaches or exceeds .700 inch and where very high spring pressure is required. The rocker studs are replaced by a single rail that’s securely fastened to the rocker arm flange of a cylinder head. Individual pairs of rocker arms pivoting on a common shaft are then fastened to the rail, essentially eliminating all flexing and deflection. Yella Terra produces a few off-the-shelf Pontiac offerings in 1.65:1 ratio for Edelbrock cylinder heads that sell for about $600. T&D Machine Products can custom make a set of shaftmounted rockers in most any ratio possible with pricing that starts at $1,000. With its 1.5:1 ratio rockers, Pontiac originally used a rocker arm stud that contains 7/16-14 base threads, and a 7/16-inch upper shoulder that tapers into 3/8-inch-diameter threads. Tightening the rocker nut to 20 ft-lbs locks it in place against the stud and automatically sets hydraulic lifter preload. Replacing the original “bottleneck” rocker studs with 7-16-inch units commonly associated with big-block Chevy engines is a common performance modification. 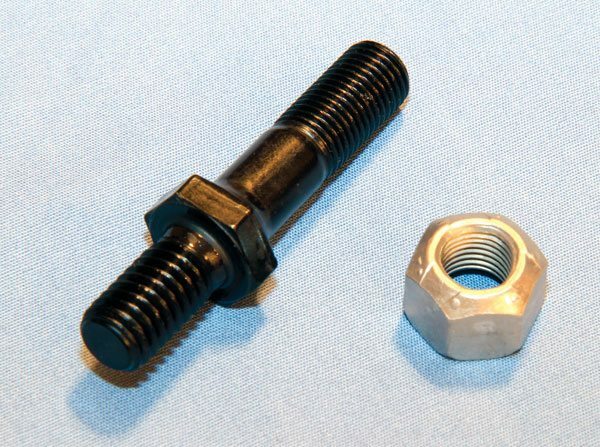 A locknut is required and it allows manual adjustment of lifter preload, which can improve high-speed engine performance, but it also has additional benefit. T&D Machine produces a premium shaft-mounted rocker arm set for the Pontiac V-8. Each set is essentially custom made for the application and a wide array of ratios is available. 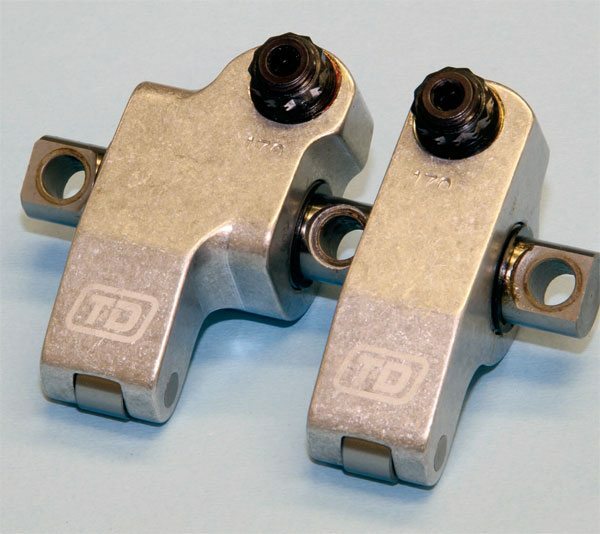 T&D also has the ability to produce the intake rocker arm with its pushrod cup offset to accommodate wide-port cylinder heads. ARP’s 7/16-inch rocker stud is the best available today. Most original and aftermarket Pontiac cylinder heads accept ARP number-135-7101. It has a flat flange on top that’s an ideal surface for the set screw of a positive locking rocker nut to tighten against. The stud design is so effective that valve lash rarely deviates from its setting even after extended periods of normal operation. Required adjustment may indicate a wear issue somewhere within the valvetrain that’s unrelated to the stud itself. Pontiac used a similar manual-lash setup when it specified 1.65:1 ratio rockers to improve reliability and durability, or when solid lifters were originally used. Combining a high-ratio rocker arm with an original 3/8-inch rocker stud can shear off the stud top, causing significant collateral damage. Even though some aftermarket rocker arms are available with 3/8-inch locknuts, I strongly suggest using 7/16-inch rocker studs regardless of performance level. Those available from ARP are among the best available. Selling for less than $50 per set, it’s cheap insurance against failure. Valvetrain instability can lead to many operational issues. When exposed to very high valve lift and/or extreme valvespring pressure, rocker studs flex under load. A “stud girdle” is a machined fixture that attaches to a bank of rocker arms to improve rigidity and maintain geometry. The girdle clamps around a special set of positive locking nuts that are compatible with most aftermarket rocker arms. There are many aftermarket stud girdles to choose from and the cost is generally less than $100. Your Pontiac engine building specialist can help you decide if a girdle is necessary for your application. Aftermarket valve covers and/or a thick spacer may be required. A pushrod is a length of metal tubing that transfers lobe lift from the lifter to the rocker arm, and its hollow center passes oil to lubricate the rocker arms and valvesprings. Because of its length, which is generally 8 inches or more in a Pontiac, it can flex slightly under heavy load, such as that created when using very high pressure valvesprings, and that can reduce valve lift. Many camshaft manufacturing companies produce high-quality pushrod sets that resist deflection, promoting maximum performance. I have had excellent results with the Hi-Tech pushrods from Comp Cams, but your Pontiac engine builder may recommend a similar offering. The pushrods in any V-8 must be of the appropriate length to maintain optimal valvetrain geometry. The stock length of 9.135 inches very rarely applies when using popular aftermarket components, but particularly with a hydraulic roller camshaft. 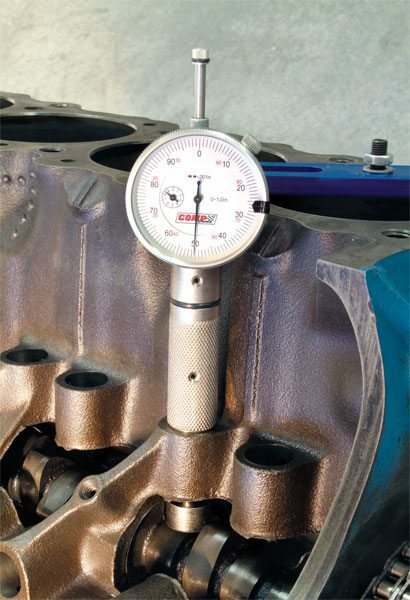 Comp Cams makes a very accurate and useful set of adjustable pushrod length checkers that allowing you to determine the exact length required. Once you achieve the proper geometry, you can then use that measurement to order new pushrods for your application. Valvesprings control valve motion. A valvespring compresses as the valve opens and must recoil controllably to keep the valve firmly on its seat without bouncing when closed. The amount of pressure a spring exerts when open and closed is determined by the number and diameter of its coil windings and the height at which it’s installed. The required amount of spring pressure is mostly dependent upon the intended operating range of the engine, aggressiveness of the cam lobe profile, and overall weight of the entire valvetrain. Pontiac originally used a dual cylindrical spring package and it was quite effective. It was retained by a large retainer and a pair of tapered locks. Aftermarket dual spring packages are available from a variety of manufacturers in a wide variety of pressure ratings. Quality sets from such manufacturers as Comp Cams, Crane Cams, or Crower Cams generally include an inner and outer spring, and internal damper. The damper is located between the springs and minimizes coil surge during operation. Custom-length pushrods are almost always required when building a high-performance engine. Along with the camshaft, lifters, and rocker arms you intend to use, an adjustable pushrod length checker and low tension “test” springs installed onto an intake and exhaust valve is used to determine the appropriate length for a particular engine. Apply a dab of white grease on the valvestem tip and install the rocker arm and adjust the pushrod to a reasonable length. Rotating the engine several times by hand clearly establishes a contact pattern. The correct length leaves a tight roll pattern at the center of the valve tip. It may take several attempts to achieve the exact required length. Pontiac originally used a dual-valvespring package in its production V-8 engines. Such sets are still an excellent choice and the aftermarket has many options containing various open and closed pressures and installation heights. Most aftermarket sets consist of an outer coil and inner coil that are separated by a damper, which absorbs harmonics. Conical (or beehive) valvesprings are growing increasingly popular. Tapering as it spirals toward the top, its shape better dissipates resonate harmonics to improve valvetrain stability while allowing a smaller retainer to reduce valvetrain mass. Its ovate wire provides sufficient spring pressure without the need for a second internal spring. While not required for every application, the use of conical valve springs in modern Pontiac builds is widespread. 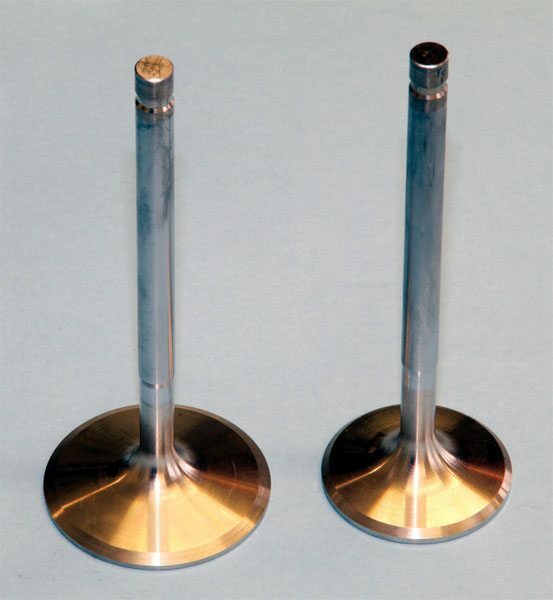 Valves constructed of stainless steel are commonly used in high-performance Pontiac rebuilds. Ferrea offers a variety of off the- shelf units specifically designed for original and aftermarket Pontiac cylinder heads. It also offers valves constructed of its Super Alloy and titanium materials for max-performance applications in popular sizes. It produces custom valves in any dimension if required. The stock Pontiac valve cover design doesn’t leave much room for aftermarket valvetrain components. Taller-than-stock valve covers are available from a number of sources, but few are as nice as the aluminum units offered by Butler Performance. Available in a variety of colors, they’re tall enough to accommodate most anything compatible with original or aftermarket Pontiac cylinder heads that use the stock layout. Valve cover spacers are available if additional height is required. Dual springs remain a very popular choice with Pontiac builders and aftermarket cylinder head manufacturers. They install easily with minimal modification and are available at a rather reasonable cost. A wide array of associated hardware is available for them and that includes stock-replacement retainers and locks, and high-strength and/or lightweight pieces constructed of tool steel or titanium. 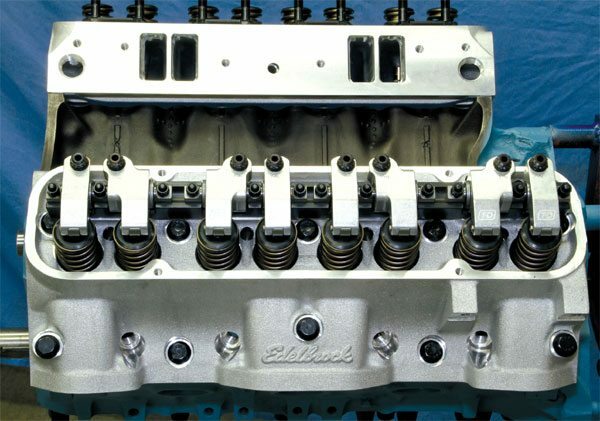 When purchasing ported or rebuilt cylinder heads from any specialist, be sure to discuss your valvetrain options to ensure the supplied valvesprings and ancillary components are compatible with your performance goal. A conical valvespring, or “beehive” spring as it’s often called, features a cylindrical shaped body that tapers as it reaches the top. The shape drastically increases spring rate and reduces the amount of moving mass within the spring, also allowing for the use of a smaller diameter retainer to further reduce weight. 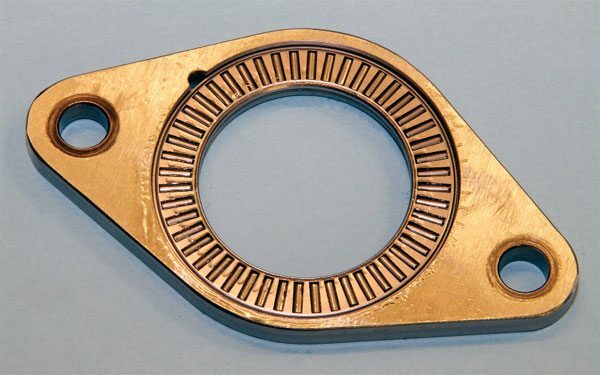 The uniquely shaped spring offers increased spring load while reducing the friction generated from added valvetrain mass and component deflection. 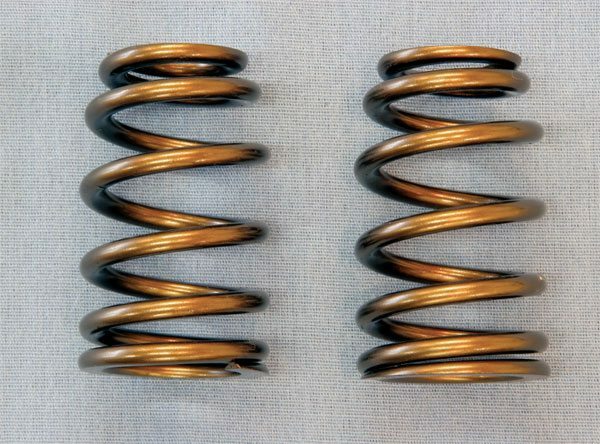 Your Pontiac engine building specialist can help you decide if such a spring is best for you. 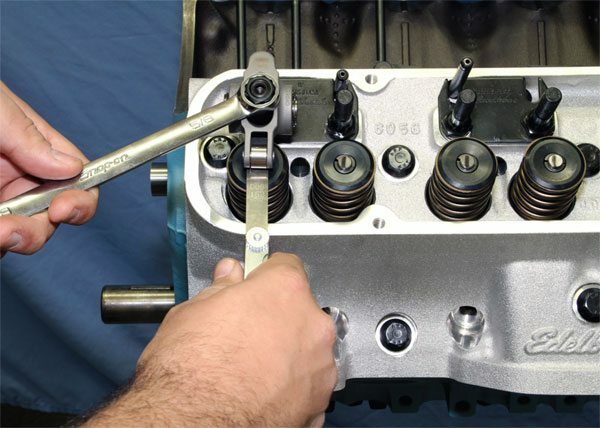 Generally speaking, any time you purchase new cylinder heads, or send your existing heads to a porting professional, it will include a new set of valves that are generally constructed of stainless steel or titanium, depending upon the application. If new valves are required, Ferrea, Manley, and SI are companies that offer top-quality valves for your Pontiac V-8 and may even be able to produce custom-spec units for you.